If you enjoy Indian cuisine, you will swoon over this dish. The first time I made it I said to Amanda, “Can you imagine what we have been missing all these years!” What a find! Besides the lip-smacking flavor, you add a long list of health benefits from the spices to an already super-healthy vegetable. 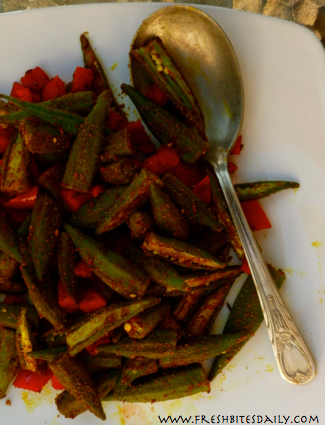 The recipe is adapted from a recipe for spicy okra found on YouTube. Angela, the demonstrating cook, gives great cooking tips and is well worth watching. I left out the asafetida she recommends because I don’t care for it. You may not feel the same way. We had no mango powder and substituted some grated lime zest. It was good, but mango powder is on our shopping list for the next trip to Bakersfield’s Middle Eastern grocery. Spices are always a matter of individual taste. Start with the ones in this recipe and adapt to suit yourself. The chili powder we have is not hot and I plan to use more of it next round or I could use a bit of cayenne pepper. You know what your family will drool over, so work toward that goal. One point of wisdom Angela offers in the video is that okra should be dry before it is fried to cut down on the slime. Really? Why did no one tell me this in the past five decades of okra? Well, she is right! I washed it and then spread it out on a cookie sheet to dry before cutting and cooking it. The result? Far, far less goo. With this dish I used tiny tender pods of okra, half of them left whole. You would expect less slime this way. But the same drying technique has worked for other dishes as well. This dish is as good at room temperature as it is hot. Consider setting it out with a collection of other finger-foods or perhaps an Indian-inspired tapas bar. Cut the caps from the okra pods. If any of the pods seem considerably fatter than the majority, slice them down the middle leaving two long halves. Heat the oil in a medium sized skillet over medium heat. When you see the oil begin to move around with the building heat, sprinkle in the cumin seed. Stir for a moment or two until the cumin becomes fragrant. Toss in the okra and toss, toss, toss. You want the okra pods to be well coated with the oil. Put on a lid and let the okra braise for about two minutes. Stir again. Repeat this until the okra is tender. My tender little pods were cooked in five minutes. Less tender okra could take up to ten minutes. 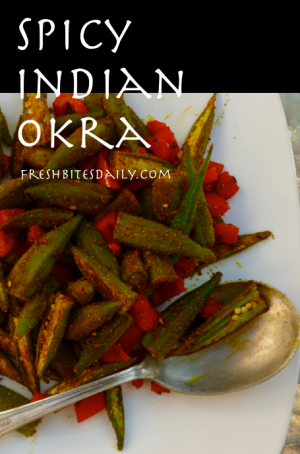 While the okra is cooking, mix together the coriander, chili powder, turmeric, and salt. Sprinkle the spices over the cooked okra (still on the fire) and toss to coat the okra evenly with the spices. Add the red bell pepper and lime zest and toss again. Cover with the lid and continue to cook for 3-4 minutes to develop the flavors further. Plan when to make this one again because you will love it!